This year's trend: Christmas Sticks. Currently, I'm the only one participating in the trend, but I'm pretty sure it'll catch on eventually! Originally, I wanted a white or silver tree with thin branches...something with a mod look to pick up on the 60's decor of the living room. After looking around, it turned out that every tree I wanted was pretty pricey. With Christmas a week away, it didn't really make sense to pay a lot of money for a tree. Thus, the birth of Christmas sticks! 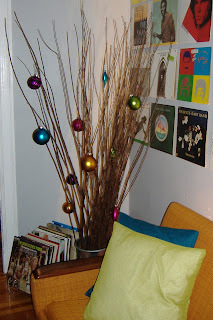 We found cute ornaments that match the room and threw them on the decorative sticks that were already in the room. It's kind of funky and weird, but it wouldn't be mine if it wasn't!! I already have some matching wrapping paper or all the gifts...I can't wait to see them under the tree!